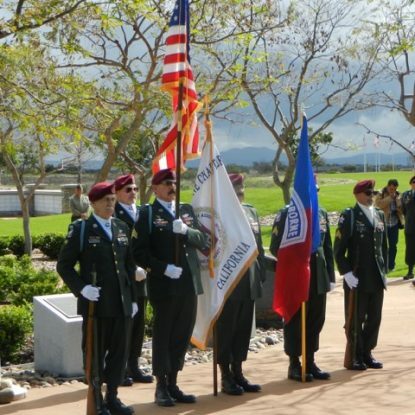 Members of the San Diego All Airborne Chapter of the 82nd Airborne Division Association – wearing maroon berets and Army dress green uniforms with trouser legs tucked into their jump boots – marched the nation’s colors into the Memorial Walkway, where the new Airborne monument stands alongside six others dedicated to veterans’ groups. Watching the ceremony were men who had made dozens of parachute jumps in all kinds of weather conditions, and into territory both hostile and friendly. And most wore their medals, ribbons, and – especially – their silver wings on their civilian jackets. 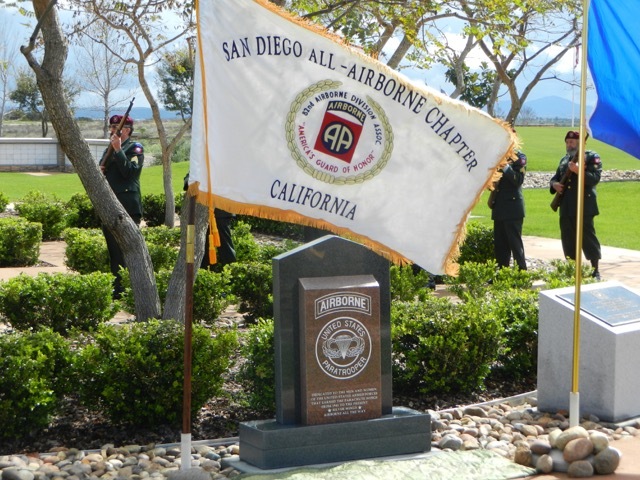 Members of the San Diego All Airborne Chapter, 82nd Airborne Division, parade the colors at the Paratrooper Monument dedication ceremony. Retired Army Staff Sergeant Miguel Alatorre, a decorated veteran of the 101st Airborne Division with multiple tours in Iraq and Afghanistan, was the featured speaker. Alatorre also is Past Commander of VFW Don Diego Post 7420 in San Diego. One veteran given special recognition at the ceremony was John A. Short of Rancho Bernardo, a member of the 173rd Airborne Brigade Association. A “smokejumper” who fought forest fires in Idaho before WWII, Short – now in his 90s – was drafted by the U.S. Army along with members of his firefighting team to teach soldiers how to jump from airplanes. He and the team – nicknamed the “Thunderbirds” – were designated the 501st Parachute Test Battalion in 1941. The inscription on the three-foot-tall granite monument states, “Dedicated to the men and women of the Armed Forces that earned the parachute wings from 1941 to present. Silver Wings. Airborne all the way!” The Airborne shoulder tab also is depicted on the monument. Members of the two veterans’ organizations raised almost $5,000 over a two-year period to design, build and erect the monument. It is made of San Marcos Blue and San Marcos Red granite, both quarried in San Diego County.